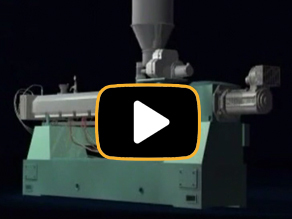 Hi-Def 3-D graphics and production floor video show twin screw extruders in operation, extruder controls, cutaway animations of what is going on inside the extruder, and how control setting adjustments affect the plastic and output. Course Description: Compounding with the Twin Screw Extruder provides training on the fundamentals of compounding with a twin screw extruder, including parts and operation, raw materials used, plastic behavior, optimizing controls, safety and startup procedures, troubleshooting and more. Employees will become experts in the startup, operation, and shutdown of the twin screw extruder. Emphasis is on maximizing productivity, safe operating procedures and quickly solving problems. The manufacturer’s of your twin-screw extruders can tell you everything there is to know about how your machines work. And there are scores of colleges and universities that can give you in-depth details about how production employees learn. But Paulson Training Programs gives you both, in a tested, reality-based, hands-on interactive training program. Compounding with the Twin Screw Extruder is the only Twin Screw training course that delivers these twin benefits, from basic operations to advanced troubleshooting. Your employees learn about your machines and about plastic behavior – another benefit that improves your productivity and quality while reducing waste. The bottom line? A win-win proposition for productivity and profitability.